This Post of the Day is on a shooting in Cleveland OH in which an armed citizen took it upon himself to intervene in a troublesome traffic stop, apparently absent any request to do so, and ultimately fire four rounds at the suspect as the suspect drove away. Might the Officer Have Lawfully Shot Mr. Helpful? A roughly 1-minute video of this interaction is embedded below, and it’s worth watching. After all, might not that unidentified civilian, first pointing a handgun towards the officer and then firing rounds only inches from the officer, have been perceived by the officer as presenting an imminent deadly force threat against which the officer would be justified in using deadly defensive force? The answer is, absolutely. And this would be true even, and maybe especially, if the stopped suspect had been armed with a gun and about to shoot at the officer himself. Might not the officer reasonably wonder if these are two armed strangers coordinating in the assassination of a police officer? The officer certainly didn’t request the assistance of the man in the Jeep, nor the firing of rounds in his direction. Also: What Was Mr. Helpful’s Deadly-Force Justification? What I’ve seen no one ask yet, however, is a different question. That is, what was the armed citizen’s justification for firing at all, and especially for shooting each of his four rounds? In order for the armed citizen to be justified in using deadly force he must be doing so to stop an imminent deadly force threat against an innocent—in this case, against either himself or the officer. This is a requirement for each round fired. Did the stopped suspect present such an imminent deadly force threat, to either the officer or the armed citizen for any, much less all, of the rounds fired? By the time the armed citizen presents his handgun for the first time his Jeep has just been bumped by the stopped driver. At this point, the police officer already has his own service pistol in his right hand and is struggling in some fashion with the driver through the window of the car. If we don’t bother with questioning why the armed citizen stopped his car and got himself involved in the first place, absent any request or apparent necessity to do so, might the circumstances possibly justify his pointing a gun towards the stopped driver and the officer (the two were inches apart from each other)? Maybe, maybe not—but we can skip that question because the armed citizen didn’t stop with merely pointing his gun, he fired shots towards the suspect and the officer. So, let’s go right to the fired shots. 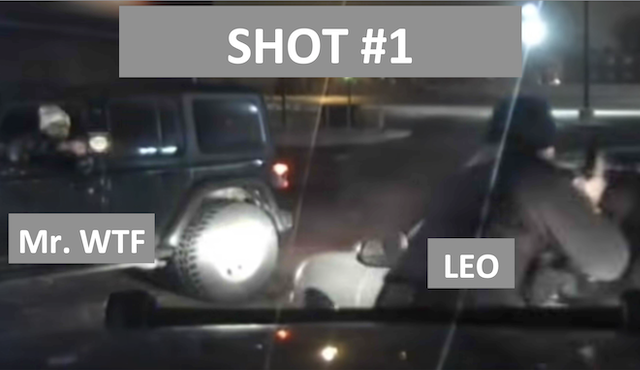 At the time the armed citizen fires his first shot (see picture below) the stopped driver has begun to turn his vehicle towards the rear of the armed citizen’s jeep, apparently intending to flee the scene. The officer has his own pistol in his right hand, muzzle up. Note that the officer who is closer to the suspect, presumably has a clearer view of the suspect’s hands, and does not have an intervening windshield between himself and the suspect, is not firing at the suspect. 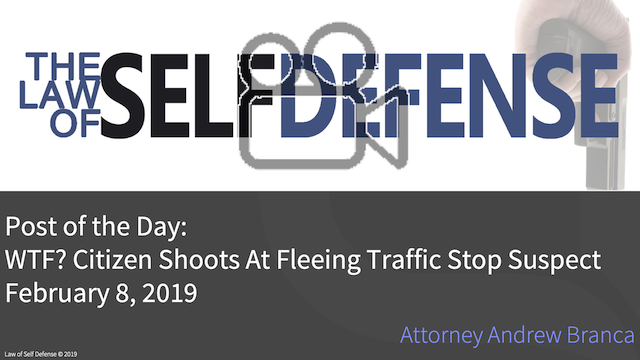 The armed citizen, in contrast, with less information than the officer and with no reason to be engaged in this fight in the first place, fires toward the stopped suspect’s car (and necessarily towards the officer). This shot obviously presents a deadly force danger to the officer. Handgun rounds that hit car windshields can go almost anywhere afterwards. Such rounds can’t be relied upon to simply continue in a straight line through the windshield and beyond. In any case, there’s no reason to believe that the armed citizen can reliably manage to not have his rounds directly strike the officer, who is only inches from the apparently intended target (the suspect). So, what exactly was the imminent deadly force threat to the armed citizen or to the officer that the armed citizen was seeking to stop by firing that round? Note that I’ve seen nothing reported that would give either the armed citizen or the officer reason to believe the stopped suspect had a gun, and we’re not allowed to simply assume the presence of a gun—so based on the evidence available the suspect’s only weapon was his car. With respect to the officer, I’ll have to defer to the apparent perception of the officer—and the fact that the officer never fired a shot at the stopped suspect, either now or later, suggests strongly that the officer himself didn’t believe the stopped driver presented an imminent deadly force threat. So what, exactly was the armed citizen’s legal justification for the use of deadly force against the stopped driver? I don’t see it. In the absence of such justification the armed citizen’s use of deadly force here is unlawful and the possible basis for some serious criminal charges (more on that below). 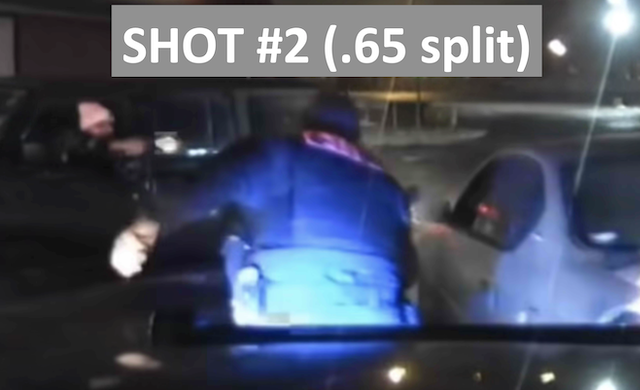 At the time the second shot is fired, see picture below, roughly 0.65 seconds after the first shot, there is now growing separation between the officer and the suspect’s vehicle as the suspect begins to flee the scene. Whatever imminent threat the suspect might have presented when the first shot was fired, that ability is now either greatly diminished or entirely absent. The suspect is driving away from, not towards, the officer, and indeed, is no longer even traveling on a path to strike the armed citizen’s jeep. Note again that the officer himself is still not firing at the suspect. What exactly is the imminent deadly force threat that would have justified the armed citizen’s use of deadly force in the form of this second shot fired towards the fleeing suspect? Again, I don’t see it. 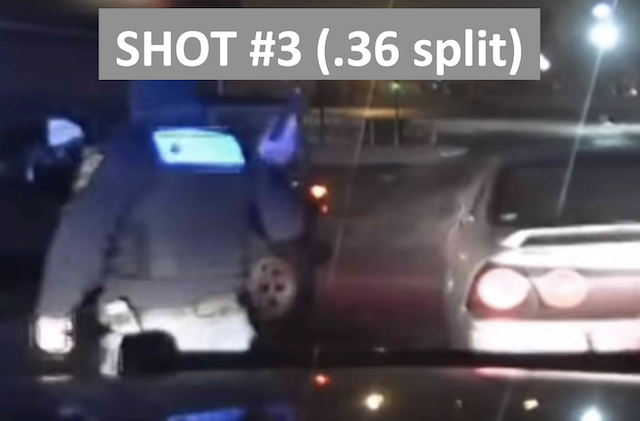 At the time the third shot is fired, see picture below, roughly .36 second after the second shot, the suspect’s vehicle is now on an obvious path of flight away from the officer and the armed citizen. Note that the officer’s muzzle is pointed up—he is still not firing at the fleeing suspect, from which we can infer that the officer did not perceive any imminent deadly force threat. Only the armed citizen is firing at the fleeing suspect. What exactly is the imminent deadly force threat that would have justified the armed citizen’s use of deadly force in the form of that third shot fired towards the fleeing suspect? Again, I don’t see it. 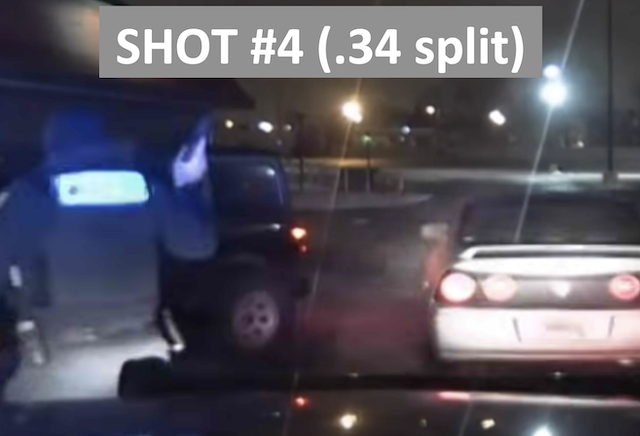 At the time the fourth shot is fired, see picture below, roughly .34 seconds after the third shot, the suspect has only continued to open more distance between the officer and the armed citizen, and if anything is a rapidly diminishing threat to either of them. The officer’s muzzle is still up, and the officer is still not shooting at the fleeing suspect, from which we can infer that the officer did not perceive any imminent deadly force threat Only the armed citizen is doing that. What exactly is the imminent deadly force threat that would have justified the armed citizen’s use of deadly force in the form of the fourth shot fired towards the fleeing suspect? Again, I don’t see it. What Charges Could that Armed Citizen Face? I’ve seen much less evidence than presented here deemed to be sufficient probable cause for a charge of aggravated assault or even attempted murder, with respect to the fleeing suspect. Further, the armed citizen could potentially face charges of reckless endangerment for the rounds he fired within inches of the officer. In both cases, the difficulty is the lack of any apparent legal justification for the armed citizen’s firing of those four rounds in the absence of a reasonably perceived imminent deadly force threat. Now, it may well be that the local prosecutor might use his discretion in the armed citizen’s favor, and choose to not bring any charges at all given the apparent good intentions involved. The bottom line, however, is that such a decision is solely within the discretion of the prosecutor. It’s solely his call now whether that armed citizen, who has made himself vulnerable to being fed into the monstrous and destructive gears of the criminal justice system, does indeed get fed into that machine. The armed citizen himself no longer has any control over his fate with respect to that future. It ought not need to be said, but I’m a huge fan of law enforcement, and indeed many of my best friends are in, or recently retired from, armed law enforcement positions at various levels of governmental jurisdiction. As such I’m a big fan of helping out law enforcement, even to the point of deploying deadly force—when such help is warranted and provided responsibly. Simply interjecting yourself into a law enforcement engagement when the actual officers involved are capable of asking for help if they need it but have not done so is a formula for chaos, and unnecessary death and destruction. And that’s true regardless of how good your intentions may be. Helping police is a good thing, but only if it’s done responsibly.